Have you ever been told a ghost story around a campfire, but before the spooky tale even gets going you’ve already sussed what the big twist is, and you’re mostly just sitting there a little bored as you wait for whoever’s telling the story to reveal that big surprise you already know is coming? That’s pretty much the experience I had with The Secret of Marrowbone, a movie that isn’t awful by any means – or at least, it’s not agonisingly difficult to sit through like a lot of other, much worse horror films – but man, is it banking on the fact that the audience is not as smart as they are, because I don’t know anyone who could watch this and not deduce everything about this movie within minutes of it starting. The film is set sometime in the late 1960s, when four British children – eldest Jack (George MacKay), Jane (Mia Goth), Billy (Charlie Heaton) and Sam (Matthew Stagg) – and their mother Rose (Nicola Harrison) relocate to a remote house in America. When their mother soon passes away from an illness, Jack swears an oath to keep his siblings together at any cost, and months later they are living a reclusive existence at the house, with only Jack venturing out into town every once in a while and meeting up with local girl Allie (Anya Taylor-Joy). However, it soon becomes clear that there is another presence in the house with them, one that may or may not be supernatural in spirit (no pun intended), and all four children begin to buckle under their restricted conditions, with Jack especially being tested with his oath of never letting anyone splitting them apart. It’s directed by Sergio G. Sánchez, the screenwriter of J.A. Bayona’s The Orphanage and The Impossible who makes his feature directing debut here, and you can feel Bayona’s influence all over this film (especially from The Orphanage) in how moody the overall tone is, how some of the shots are lit, and some of its build-up. It’s a competently made film, with some spooky cinematography certainly illuminating the atmosphere, and the performances by the actors are pretty solid (most of them are, anyway; there are one or two hokey and unsubtle actors crammed in there). By most accounts, it’s a somewhat straightforward movie, filmmaking-wise at the very least. However, its biggest problem is its sheer predictability, and unfortunately in this instance it can really hurt the overall experience. By the time the main title card appears at the start of the movie, after a brief prologue explaining the characters’ situation, there’s something that happens which heavily signals that not all is right with these children, and right away you can kind of guess what that is through some very telling direction and dialogue in the scenes following immediately after, which even a toddler could pick up on. Unfortunately, for the majority of the movie, it’s holding that card pretty damn close to its chest, and it’s frustrating because you’ve already had a peek at said card and are just waiting for them to play their hand just so they can get this game going a lot faster than it is. Because you’re constantly anticipating when the other shoe will drop, that can distract you from a lot of the other character moments since all you can think about is how this is all working within the reality of the twist you’ve correctly assumed there to be, and there’s nothing really too outstanding about it to properly divert your attention away from how obvious this twist is. As a result, the film tends to be something of a dull stretch; not unwatchable by any means, but not exciting or even scary enough to be properly suspenseful, because in your mind all suspense has evaporated since you have already most likely summarised what the big reveal is going to be, and you’re just waiting for the movie to catch up with you instead of being properly unnerved like it is intending for you to be. Like I said, this is a movie that is really banking on the fact that its audience seriously can’t figure out what is happening until it is explained what’s really going on, and that’s a shame given that this director has written some pretty intelligent movies in the past. I don’t usually pick up on twists this early into a film – and whenever they are revealed, I always end up feeling stupid for not picking up on it sooner – but the fact that I did with this film, and it waits until the last act to finally pull the curtain, that seriously indicates that this is a film that probably doesn’t have as much respect for its audience as it thinks it does, because this twist is made so painfully obvious from the first few minutes onwards that someone with half a brain can figure it out, yet it’s so adamant that you haven’t guessed it by then that it keeps playing this game right up to its climax. I would be very interested to meet people who see this movie and genuinely have no clue about the twist until it is revealed, because I seriously want to know if afterwards they felt dumber for not deducing it despite all the clues being right there on the screen. Something tells me that there won’t be that many people like that, because for the most part audiences are a lot smarter than they seem, and can pick up on these things so quickly nowadays it’s not even funny. Again, while I can’t say that The Secret of Marrowbone is an absolutely awful movie, I still think it should have had more respect for its audience’s intelligence than it probably gave them. 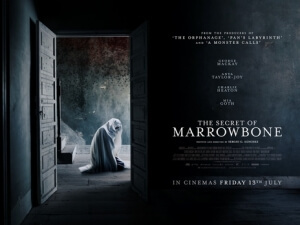 The Secret of Marrowbone is a frustrating movie, because while it is competently made and solidly acted, it banks heavily on the fact that its audience can’t deduce its big twist until all is revealed, which unfortunately you easily can and just as quickly feel unentertained as you wait for them to catch up with you.